You scratch my back and I'll scratch yours!! Lets take a look at a few of the amazing blogs that decorate the top of our favorite blogs list at the moment! These bloggers are wonderful people who are passionate about what they do! Lets show them some appreciation by showing some love! The Binder Ladies is a one stop shop for frugal shopping tips, Coupons galore and all kinds of useful money saving info for anyone who's looking to save some money!! Deals available for US and Canada!! The blog is ran by one of close blogger friends - Jeni - who loves couponing and bringing her readers deals that'll blow their minds while keeping their pockets full!! Pea of Sweetness is a lovely blog that contains all kinds of different content including product reviews, giveaways, homeschooling advice and resources, natural/eco-friendly living information, parenting, special needs children, faith and much more. My dear friend Emilee is a wonderful blogger and deserves no less then the best readers on the web! Savory Savings is a "greentastic" blog full of daily savings on groceries, household needs and pretty much anything else you could think of! You'll also find tons or natural/eco-friendly reviews and information for all of your "Green" needs! Give Krista a visit and see what all she can do for you! A Lucky Ladybug is a busy blog of bluntly honest product reviews, awesome giveaways of all shape and size, "Go Green" tips and info, money saving deals, coupons, recipes and so much more! Randi not only runs her blogs but has also conducts an amazing blogger network called The M.O.O.N Network where much time and sweat is spent making sure everyone is treated fairly and gets the help they need when it comes to blogging, social media and all the other fun tasks that fill up the life of a blogger! This is one blog that you don't wanna pass by! A blog full of honest opinions, reviews, giveaways, travel info and so much more! 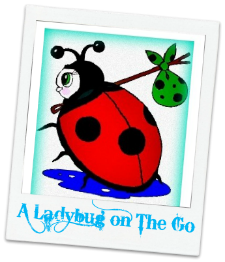 From a woman who has been through enough to know struggle, loss and gain - You'll enjoy the time spend on A Ladybug on the Go!